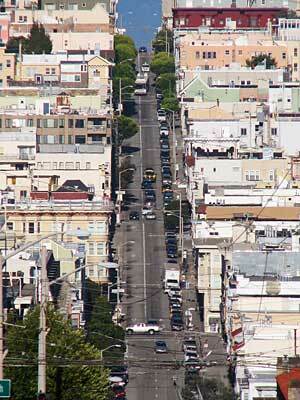 San Francisco would not be San Francisco without its hills. No matter where in the city you are, there is always a breathtaking view only a few blocks away, and often even locals are surprised when they look down a street in an unfamiliar neighborhood. There is always the moment when one nods and says: "Ah - so that's what it looks like from over here!" When I came to San Francisco in the early nineties as a tourist, I would spend days just walking up and down across the hills of this beautiful city, aimlessly getting lost and being supremely happy about it. And even now after living here for almost ten years I still can fill a whole Sunday just wandering around, zig-zagging across the neighborhoods, from one hill-top park to the next. 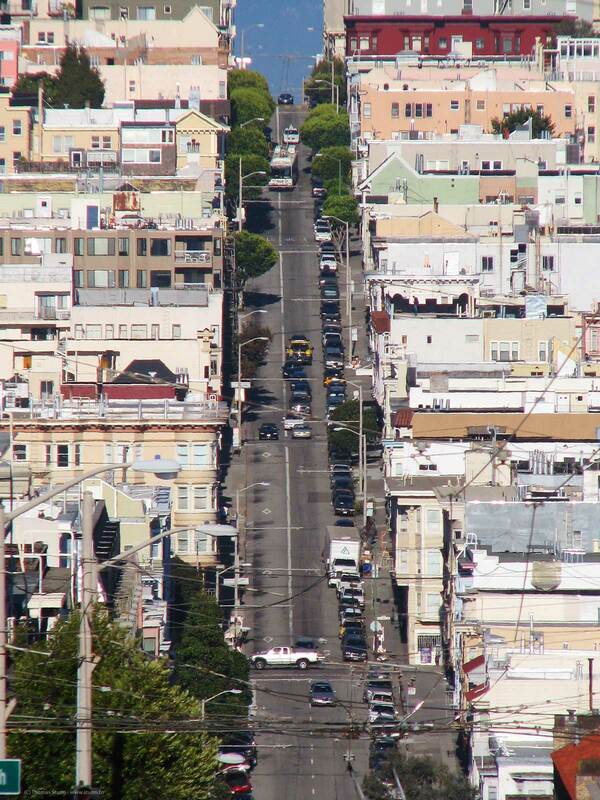 Here's a typical view from Pacific Heights across Van Ness and Polk streets towards Nob Hill in the east. Sacramento street drops dramatically from the top of the hill down into Polk Gulch, with the westbound #1 Muni bus stopping at every corner - a necessity in a city where elderly citizens often can not walk up or down the block they are living on. This shot was taken with the Canon S2IS with its very long digital zoom, and I'm very pleased with the shortened perspective the zoom creates. It turns all the pastel colored buildings on the hill into a two-dimensional pattern with the street rising straight up between them.